As has been well documented over the last 12-18 months, British boxing is in the middle of a purple patch with success stemming directly from the amateurs and flowing all the way to the top. It’s a situation whereby everyone has benefited and no scene less so than the women’s game. Go back to before London 2012 and you’d have been hard-pressed to name a single female boxer who’s galvanized public attention but in the wake of women’s boxing debut at those London Olympics, there’s been a definitive boom. Nicola Adams, Katie Taylor, Chantelle Cameron, Savannah Marshall, Hannah Rankin to name just a few are all leading the way forward for the sport, bringing in the punters and the television numbers as they seek to inspire a whole new generation of young boxers, female and male, to pursue the dreams without limitation. 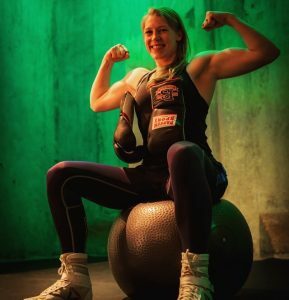 I was fortunate enough to speak to Hannah Rankin in the week, an exceptional fighter who was unfortunate to lose her undefeated moniker at the hands of Joanna Ekedahl in Norway of October last year but by her own admission that controversial defeat has only served as extra motivation on her journey towards the top. Earlier this year frustration struck again when her history-making Commonwealth title fight – she would have been the first such women’s champion had she have won – was cancelled due to visa issues with the opponent but the small silver lining came when the WBA ranked her in their Top 10 meaning a title tilt of her very own is now no longer just a dream. The reality of Rankin is that she can punch, she can move and, heck, is she one down to earth person. Outside of boxing she plays the bassoon – now, I had no idea what that was – and she was gracious enough to forgive my stupidity and explain just what the instrument could do. Here we have, then, a boxer and a bassoonist which for many years was her Twitter account “BoxinNBassonin” and the reason I mention that is because she’s had her fair bit of back and forth on the social media platform between Claressa Shields but it’s a sign of her faith and belief, rather than any arrogance, that she can challenge those at the very top. Hannah, great to speak to you, you’re 4 and 1 as a pro but I just want to go back to the start, how did you first get into boxing? I got into boxing when I moved to London. I was doing Thai boxing just to keep fit and my trainer left and handed me over to Derek Williams who started to teach me to box and I fell in love with it! I wanted to compete and that’s when I started training with Noel Callan my trainer now because he could corner me for white collar fights and we hit it off. The three of us are a great team. And when did you first think turning pro was a possibility? I first thought about turning pro after my 5th white collar fight. I was struggling to get opponents and Derek and Noel said if I wanted to take it further I could go down the amateur route or the pro route. I wanted to stick with my team so I decided to go pro and that’s me been a pro for just over a year now. As I say you’re 4-1 and everyone always says you learn more from defeats than wins, has that proven to be the case for you? It’s definitely true to say you learn more from your defeats, especially when you know you actually won a fight but the decision doesn’t go your way. It’s harder to come to accept a loss that you feel was unfair because if you lost you can take away from the fight the things you didn’t do well, that made you lose, and work on them. However, it did make me more motivated to prove the loss wrong and I worked even harder for the next fight and won my first belt, the International Challenge Belt at York Hall. That fight was in Norway, what did you make of that opportunity? Fighting in Norway was an amazing opportunity and one that I will never forget. I boxed on PPV TV in front of thousands of people on the undercard of a Unified welterweight championship fight between Mikaela Lauren and Cecilia Braekhus and did the Ring walk with Mikaela who is a training partner of mine and a good friend. Not many people can say they have done that in their first year as a pro! It was awesome! Now earlier this year you were meant to be in a history making fight for the Commonwealth belt, it got postponed for various reasons, how frustrating is it for you when fights get cancelled through no fault of your own? My Commonwealth Title shot getting cancelled was very frustrating! I’d had an amazing camp and was really ready to take that title and for it to fall through in the last week was devastating. It was also disappointing for friends and family who were all looking forward to me fighting for the title at home in Scotland. Is it easy to keep motivated in those moments? It’s hard to stay motivated when you hear at first as you feel quite deflated about the whole thing. But Noel and Sam Kynoch soon had me confirmed for the June the 16th MTK Scotland Show so I had some time off and then started getting ready again with the new date in mind. Of course the women’s game is still growing, is it hard to get opponents for you? Yes it is hard to get opponents. From super welter weight up there are not as many girls in those weight classes to choose from which is why you often see them fight each other more than once. It’s not the same as the guys where there are lots to choose from and you can have learning fights. You’ve had a bit of back and forth with Claressa Shields on Twitter, do you back yourself in that fight were it to happen? With regards to Claressa. I’m not scared to test myself so of course I back myself in that or any fight, otherwise there’s no point in trying to get to the top! Being ranked by the WBA is great recognition, how long will it be until we see some titles coming your way? Getting ranked by the WBA was awesome and great recognition for me. Title wise- watch this space! Outside of boxing you play the bassoon, it might be a stupid question but what is a bassoon? I thought it was an animal! So outside of Boxing I’m a classical musician and I play the Bassoon in orchestras and I also teach. It’s a woodwind instrument that’s quite quirky! Not quite an animal! Ha! though it usually gets the interesting characters to portray in the music!